A mix of old time cowgirl with grit and determination, using long standing remedies and practices with new technology in therapies combine into Christy’s care and rehabilitation operational plan. Christy Bourbonnais has been­ studying the art of riding through various disciplines for over 40 years. 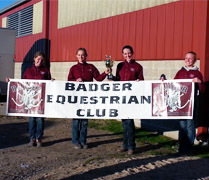 When Christy graduated from high school, she began building her herd for her training and lesson programs. I have always been obsessed with horses, their life, their abilities and their personalities. I feel like a crusader helping the horse as best I can. Part of that means I had to educate myself, learn by experience as well as learn from those who were at the top of their game. I felt compelled to learn all I could absorb about the horse and subsequently the rider. I realize that not everyone is as enthusiastic as I am about the horse. So, I feel my life’s work is to take care of them in a way that best serves the horse. I always believed that no matter whom you are or what level you show or train within, you can always learn something from others. At an early age, I began seeking out further information and advanced instruction. One of the first instructors I sought training from was Ray Hunt. With Ray's guidance, I started various colts and worked through road blocks that client horses were displaying. From there, I began participating in numerous clinics and training sessions with such instructors and mentors as Martha Josey, Richard Shrake, Buster McLaurey, Connie Combs, Curt Pate, Bryan Nuebert, Clinton Anderson, Charymane James, Craig Cameron, Sharon Camarillo and Marlene McRae to name a “few”. I worked as an assistant trainer for various barns to further enhance my education and hone my skills. I continued to take Dressage lessons from local trainers and from other clinicians. Before Western Dressage was a “discipline,” I combined the two from my early training. I remember Lynn Palm and the rest of the clinic participants giggling as I came into the ring in all western tack for a Dressage clinic. Not only was I in western tack, but it was barrel racing tack! When prompted, I explained that my horse was a 3 year old home bred gelding who I had raised and trained and was competing at barrel races. Even one’s eyes showed me they were wondering what I was doing in a dressage clinic until it was my time to ride a pattern. Afterwards, Lynn asked me if my horse was really a barrel horse. I said he sure was and I set up three barrels and laid down a sweet run. Lynn and the group of riders were a bit amazed. I simply smiled. Christy feels fortunate to have had worked with such great people and great horses. My clients have stood by my side and have been with me for years. I have built an excellent relationship with each client and there has always been respect, trust, honesty, and lifelong working relationships. 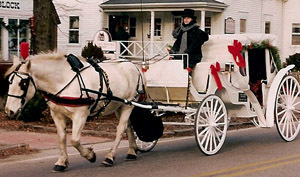 Each client's horse that is brought in for training is truly given special attention. I really fall in love with each horse and it shows. I have a soft, yet great presence about me and horses tend to migrate to me as a leader. I have taken the time to mentor many individuals with their riding, goals and often life coaching. I take a whole rounded approach to working with the riders and their horses. I look at all the pieces and try to uncover each element and see if I can enhance those areas. I believe how one feels on the inside will be reflected on the outside. Many times horses and riders come to me for more than just lessons and training. I enjoy looking at each individual horse and rider and trying to help them in many facets of their lives. That is why I recommend Isagenix, Xango and Life Wave products. I believe in them and I am willing to discuss any of them with those who are willing to enhance their lives. I put together many of my favorite natural products into a separate business called Sassy Cowgirl. 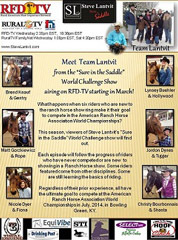 I was featured in RFDTV’s 2014 Sure in the Saddle World Challenge TV Show. The whole experience was incredible and a great eye opener in the field of TV production. I was given the opportunity to perform at the first ever, 2014 RFDTV’s The American. 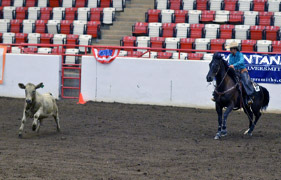 It was the world’s largest rodeo and brought together some of the best rodeo competitors. I was honored to be a part of the event! I met some of the nicest people and learned a great deal about RFDTV. I am thankful to the show’s creator, for asking me to be a part of the whole production. It was a lot of fun and great experience. For the TV show, I took my young green broke colt, and started riding him right on TV! No pressure. I actually thought we would have a bucking spree for he was unridden for months! All went very quietly for his first ride. Especially since I had to drive 7 hours then stay overnight, then drive another few hours in a terrible blizzard to our filming location in February. Once on site we all began to decompress and thaw out. Filming went well, but I felt my horse lacked some luster. At first I thought it was due to being unridden and therefore a bit stiff. After a couple of weeks I realized something was off with him but I could not place it. After some investigation, It was determined that he was symptomatic for EPM. I treated him and continued his showing and training. His recover was long and slow. He was having difficulty with mind/hoof coordination. But I knew if I worked him slowly and rebuilt his body and gave him plenty of breaks that he would be a better horse because of it all. We started his training in February and by the beginning of July we were showing in the American Ranch Horse Association World Championship Show in Bowling Green, KY. We competed in versatility events except for conformation. My horse needed a break and getting him some rest and rehab time was in his best interest. This helped for after a day of rest he had his best rides and his movement improved. In our hardest class which had three components of reining, cow work and roping we placed 8th in the Pro Division. This horse has continued to improve and is now looking a thousand times better. I will continue his training and showing. Christy is always looking for the positive in the horse. I have worked with various breeds including Quarter horses, Thoroughbreds, A﻿ ppaloosas, Paints, Standardbreds, Saddlebreds, mixes and more. I have competed at open, local, breed, world and national shows. I have blued in many shows over the years. Christy has been an NBHA World Show Qualifier over 9 times now - and not just on her own horses, but also on her client's horses! 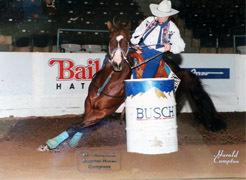 Her great paint horse Speck earned his ROM in barrels. Her famous barrel horse Mac basically bought her ranch. I enjoy the challenge of trying to reach the heart of the horse and teaching them to be confident enough to excel in their respective areas. I have plenty of grit and determination to get the job done. This has labeled me the title of the “Sassy Cowgirl”. Christy’s basic philosophy with regards to the horse has not changed over the years. I truly believe that with understanding, knowledge, training, experience, discipline and hard work; a true connection, softness, and eloquence can be obtained with the horse and rider. I am always hungry for more knowledge and even more ready to lend a hand and help someone else succeed with their horse. I believe the possibilities are endless! 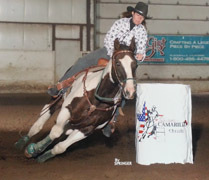 Christy is an AQHA Professional Horseman, Certified Western Dressage Instructor, member of American Quarter Horse Association, American Paint Horse Association, and Appaloosa Horse Club, National Barrel Horse Association, United States Equestrian Federation, Wisconsin Roper’s Association and many others. 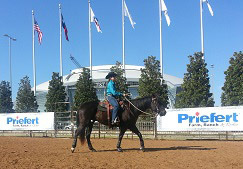 ♦ Christy has been a star on RFDTV’s 2014 season of ”Sure in the Saddle World Challenge”. 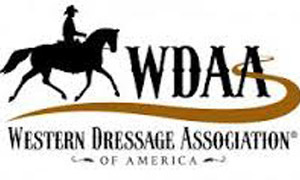 ♦ Demonstration rider at the 2014 RFDTV’s The American. 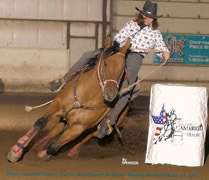 ♦ Competitor in versatility, ranch horse classes, barrels, poles, roping, Western and English pleasure.